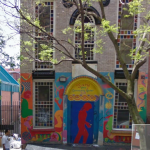 From its beginning, the Sixth Street Community Center has fostered economic and community development through a variety of programs including after school, summer day camp, tenants’ rights, and life skills and career development for teens. In 1996 the Community Center initiated a community supported agriculture program to provide fresh local produce to city residents. Building on the CSA, new efforts emerged in the areas of youth, food safety and community entrepreneurship. Now the Community Center is home to four related efforts: the CSA, Seeds to Supper (a program for teens in sustainable agriculture and culinary arts), SOS Food (advocacy around food safety issues) and our new Organic Soul Café.